Now you can crochet the cutest little elves for your children fashion dolls with this Elves crochet pattern! Bundle Savings – Grab me for free in the Fashion Doll Christmas Bundle! Instructions include how to crochet all the items pictured - including the dresses, tops, pants, stockings, hats, slippers, and a mini tool set with a hammer, a screw driver, a saw and a tool box to boot. 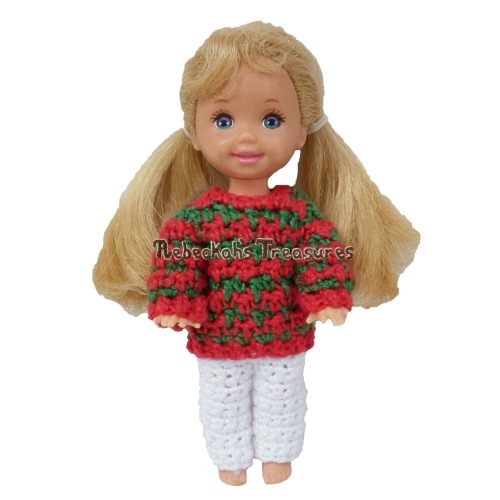 Plus, it includes several variations for the apparel so you can crochet an elf that is uniquely you! This PDF formatted pattern has 11 pages (2.7MB), including a cover page and a handy abbreviations chart page. It uses US Terms. Fits 4 1/2" child fashion dolls.